21 Amazing Things That Happened On The Final Of "The Great British Bake Off"
1. It was a tense season, but here is the final three. 2. For the technical challenge, Paul brought back Pastry. 3. Kimberley wasn't bothered - she had a conspiracy theory. 4. Frances made a picnic pie. 5. Kimberley decorated with pigs. 6. And Ruby kept things vegetarian. 7. There was no history bit this week but look - Baby Ruby! 8. Mel tried a dodgy New York accent. 9. And Paul refused to let the final affect his demeanour. 10. The showstopper challenge was indeed showstopping: A Wedding cake. 11. KImberley made a special stamp for hers. 12. And despite not believing in weddings, Ruby made a thing of beauty. 13. And with that, it was time up. 14. There was a sweet moment between Sue and Ruby. 15. France's showstopper was so large she needed Paul's help to carry it. 16. Past and present contestants gathered at a garden party (complete with coconut shy). 17. The three finalists awaited the decision. 21. 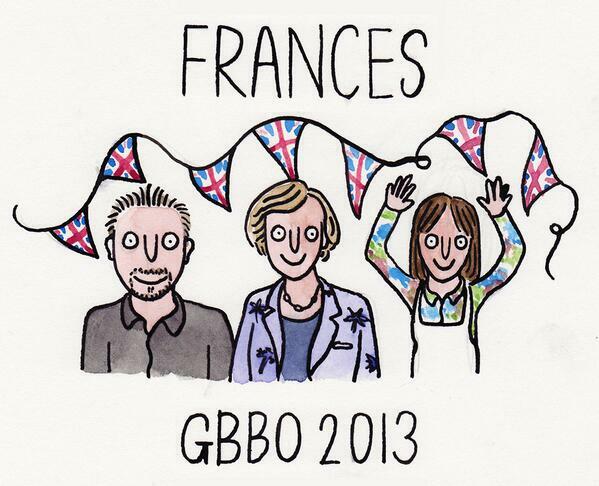 And the winner is...Frances! Hooray!